In North Korea, there are several sectors that can be considered for trade and investment. They include agribusiness, fishing, shipbuilding, logistics, minerals, information technology, and garments. Garment processing has been one of the most successful export-related activities. Companies in the Netherlands, Germany, France, China, and South Korea are producing various kinds of clothing in North Korea and some of the local factories have become very large and experienced exporters. With a highly skilled labor force and with the lowest wages in Asia, a growing number of foreign garment firms are currently operating in-country. For some European companies, purchasing clothing from North Korea is nothing new. Already in the 1970s, resulting from its trade with Romania, a Dutch firm came into contact with a factory in North Korea and started importing clothing, such as T-shirts. In this period, the Soviet Bloc was the major trade partner for North Korea. Korean factories imported various textile materials, including cotton, from Eastern European countries. Most of the woven cloth and garments were then exported back to these markets. Since the 1980s, technological advancements in North Korea’s garment processing industry and the country’s accumulation of export experiences have spurred growth in trade with Europe, including clients from Germany, the Netherlands, and France as well as with Canada, Japan, and Hong Kong. From the beginning of 1990s, however, North Korea’s garment processing exports saw a reduction in volume due to several factors including international political changes, economic sanctions and an international quota system (which resulted in a tariff disadvantage for products made in North Korea). This downward trend has changed during the last ten years, through increased cooperation and exchange with different countries, resulting in export growth. 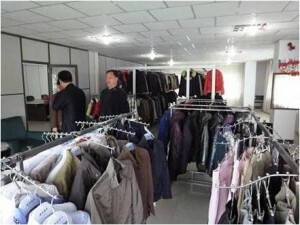 Clothing now accounts for a large portion of North Korea’s light industry sector and is a major export sector. It is also a successful foreign investment activity, with Chinese companies taking the lead in using North Korea as a production base. Also, several large, well-known European textile clients, such as C&A from the Netherlands and Gerry Weber from Germany have experiences with manufacturing in the North. There are about 15 large garment exporting enterprises in North Korea, each operating several factories spread around the country (see table 1), and dozens of medium sized companies. In addition, there are some 30 crochet and embroidery exporters. These exporters have a wide range of machinery available (e.g. for cutting, sewing, sealing, ironing, pressing, and embroidering) and use Computer Aided Design (CAD) and Computer Aided Manufacturing (CAM) equipment. They also have facilities for washing, packaging, and transport, and some operate scientific research and technical service institutions. The North Korean labor force in garment processing is considered highly skilled and flexible. Workers are available in large numbers. They produce a large variety of clothing, such as T-shirts, underwear, bras, leisure wear, trousers, sportswear, winter clothes, children’s clothes, knitwear, suits, overcoats, padded clothes, sportswear, work clothes, and uniforms. The specific quality of the products is made according to the client’s specifications. Quality control is always done by the factory, but additional checks can be done by the client’s staff if desired. It is also possible to outsource these controls to specialized local agencies. Apart from the existing infrastructure and skilled workforce, an important advantage of North Korea is the low production costs. The labor costs are significantly lower than in other Asian countries. Since the production costs in China are rising, a growing number of manufacturing companies are adopting the “China plus one” strategy, where apart from China, another cheaper production country is selected. Moreover, in certain parts of China the supply of skilled labor is becoming scarce. North Korea is an attractive alternative location, especially appealing for the most labor-intensive products. Sometimes, even single items are now being produced in two countries, for example hand-knitted pullovers. The front side, which is the most complicated and labor-intensive part, is knit in North Korea. The back side, which is the easiest part, is still knit in China, where the two parts are also assembled. Prices of garments are based on “Cut and Make” (CM) terms: the cost to produce the item is based on the time needed for cutting the fabrics and making the garments. These CM-costs are substantially lower than in China or other competing countries in Asia. Quantities: suits 450.000 sets/year; jackets 3.000.000 pcs/year; winter clothes 5.000.000 pcs/year; sportswear 4.500.000 pcs/year; down wear 1.500.000 pcs/year, etc. Apart from using North Korean companies directly, there are also other options available. In order to attract foreign investment, Special Economic Zones have been set up. The first one is located in the far north at the China-Russia border, near the cities of Rajin and Sonbong: the Rason Special Economic Zone. With minimum wages of 80 USD per month, the costs of garment production are around 30 percent lower than in Northeast China. However, the number of textile producing companies in this zone is still limited. Just across the demilitarized zone from South Korea, the Special Economic Zone near Kaesong is much more popular. The Kaesong Industrial Complex (KIC), developed in an agreement between North and South Korea, was established in 2004. Currently, more than 102 South Korean companies employ over 50.000 North Korean workers in various sectors. Their productivity levels are close to those in South Korean factories, with low labor costs (around 110 USD per month) and favorable corporate tax rates. Around 70 are active in the field of clothing and textiles. One of those, Shin Won, employs 1.250 North Korean workers; the company considers its Kaesong factory to be optimal when compared to its other facilities in China, Indonesia, Vietnam, and Guatemala. 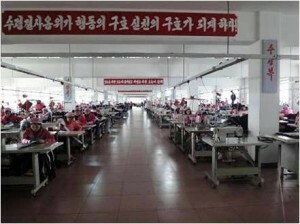 The total annual value of the garment production in Kaesong is estimated around 200 million USD. Clothing factories in several countries are employing North Koreans directly, especially in Chinese cities near the border. For example, hundreds of North Korean workers are employed in an underwear factory in Tumen. Much larger numbers can be found in Dandong, the border city on the Yalu River, where companies from other countries are also using these migrant workers. One example includes the Ari Sports factory, a South Korean venture that produces football sneakers and sports clothing. It is expected that the number of North Korean workers in China will grow fast. Since early 2012, the Chinese government has issued work visas for 40.000 North Koreans to work in the three Northeast provinces: Jilin, Liaoning, and Heilongjiang. Also, Mongolia allows North Korean workers to take jobs at local garment factories. The popular British clothing brand Edinburgh Woollen Mill, for example, is using a Mongolian firm employing 80 North Korean women to produce its cashmere jumpers. Korean textile workers can also be found in a number of other countries, such as the Czech Republic or countries in the Middle East. For companies interested in working with North Korea, one of the most important challenges is finding a suitable business partner. Collecting sufficient information about available factories is not easy. Local garment companies might have a presence on “Kwangmyong,” the local Intranet, but this information is not visible outside the country. Case studies or references from other foreign users are also scarce. Establishing contacts inside North Korea through middlemen or agents is possible, but companies have found that a more effective alternative is to send representatives to Pyongyang. Taking part in a business mission has proven to be the most informative way to tour factories, visit clothing showrooms, select potential partners, negotiate prices and delivery terms, and explore business opportunities. One approach that has worked well is, based on the specific demands of the customer, to preselect companies before the actual visit takes place. For example, it makes no sense to select a huge enterprise when the client is only interested in producing small quantities. Preselection can make the duration of the visit relatively short (see table 2). Often during a first trip, the Korean companies will be able to produce samples based on requirements of the foreign client for inspection. After the initial selection of the factory (or factories), a second visit often takes place to arrange the preparations of the trial production in detail. One important challenge facing foreign companies is that specific fabrics and trimmings (accessories such as buttons, zippers, etc.) might not be available in North Korea, and need to be imported. China is the main source for these materials, and is also used to transport the finished goods to the final destination. Often an agent is hired for the required logistical issues and also for additional quality control (the large Korean companies usually have their own agents in China). The economic recession in Europe and overall rising production costs have caused garment producers to look again for new sources of supply. In the 1990s, European companies started to move production to Portugal. Fifteen years ago, they moved to Eastern Europe and then to Asia. China became a favorite location. As part of the current “China plus one” strategy, producers are also searching for another cheap production destination. North Korea is an attractive option because of its existing infrastructure, skilled labor, and very competitive rates. It might be less visible than competing nations such as Vietnam or Bangladesh, but a growing number of foreign companies are now exploring the country, with those from China taking the lead.